We use low- and mid-latitude wind data from the Wind Imaging Interferometer (WINDII) on board the Upper Atmosphere Research Satellite (UARS) to study the average response of nighttime upper thermospheric winds to geomagnetic activity. We calculate perturbation winds in magnetic coordinates and analyze them as a function of magnetic local time, latitude, geomagnetic activity, and solar EUV flux. The nighttime zonal disturbance winds are predominately westward, with the strongest effects extending from dusk at 70° to midnight at 45°. Westward disturbance winds are also observed throughout most of the night at low latitudes, where they change to eastward at dawn. Eastward perturbations occur in the post-midnight sector above 50°. The meridional disturbance winds are primarily equatorward above 40° and after 0300 MLT. In the midnight sector during low and moderate solar flux conditions, poleward winds are observed below 40°; during solar maximum, the perturbations are largely equatorward throughout the night. 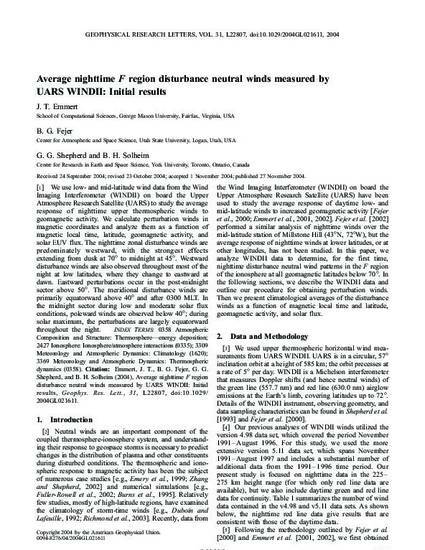 Emmert, J. T., B. G. Fejer, G. G. Shepherd, and B. H. Solheim, Average nighttime F region disturbance neutral winds measured by WINDI UARS: Initial results, Geophys. Res. Lett., 31, L22807, doi:10.1029/2004GL02l611, 2004.